James Laughlin—poet, publisher, world-class skier—was the man behind some of the most daring, revolutionary works in verse and prose of the twentieth century. 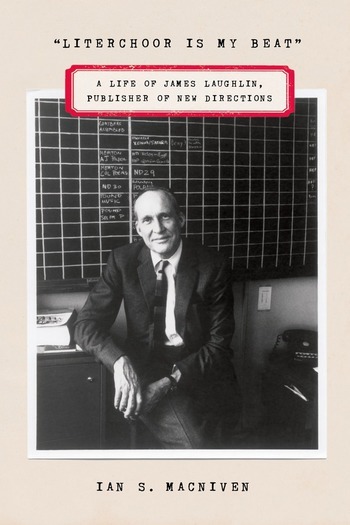 As the founder of New Directions, he published Ezra Pound's The Cantos and William Carlos Williams's Paterson; he brought Hermann Hesse and Jorge Luis Borges to an American audience. Throughout his life, this tall, charismatic intellectual, athlete, and entrepreneur preferred to stay hidden. But no longer—in "Literchoor Is My Beat": A Life of James Laughlin, Publisher of New Directions, Ian S. MacNiven has given us a sensitive and revealing portrait of this visionary and the understory of the last century of American letters. Laughlin—or J, as MacNiven calls him—emerges as an impressive and complex figure: energetic, idealistic, and hardworking, but also plagued by doubts—not about his ability to identify and nurture talent but about his own worth as a writer. Haunted by his father's struggles with bipolar disorder, J threw himself into a flurry of activity, pulling together the first New Directions anthology before he'd graduated from Harvard and purchasing and managing a ski resort in Utah. MacNiven's portrait is comprehensive and vital, spiced with Ezra Pound's eccentric letters, J's romantic foibles, and anecdotes from a seat-of-your-pants era of publishing now gone by. A story about the struggle to publish only the best, it is itself an example of literary biography at its finest. Praise for "Literchoor Is My Beat"
Ian S. MacNiven's authorized biography of Lawrence Durrell was a New York Times Notable Book for 1998. He has edited two collections of Durrell's correspondence (with Richard Aldington and Henry Miller), is the author of numerous articles on literary modernism, and has directed and spoken at conferences on three continents. He is also a past president of the D. H. Lawrence Society of North America and of the International Lawrence Durrell Society. MacNiven resides on the west bank of the Hudson, outside the town of Athens, New York.